Hello Kitty: Stump Village – A Place for Fun! Hello Kitty is a household name around the world, not unlike Mickey Mouse. You don’t have to travel far before you run across some Hello Kitty merchandise at the mall, in a department store, or even in a zoo’s gift shop. After more than 30 years Hello Kitty continues to become more popular. 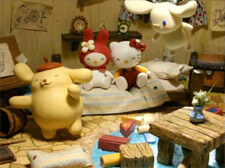 Knowing this, Sanrio has developed a new Hello Kitty TV series for 2006 that is animated using only claymation. 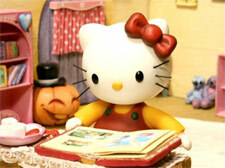 DVD: Hello Kitty: Stump Village – A Place of Fun! Notes: Review is based on a DVDR Screener copy, not the final product. 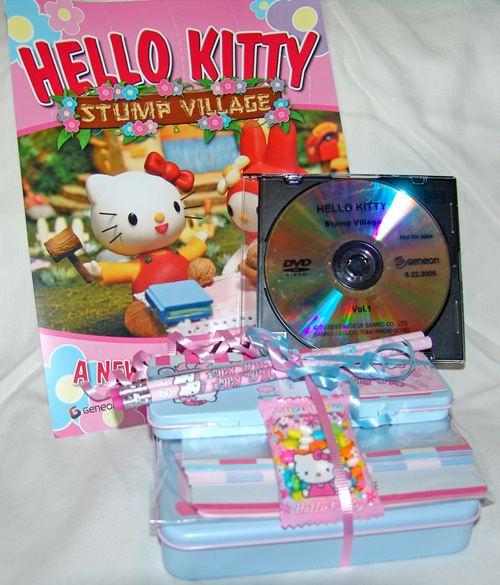 Hello Kitty: Stump Village is a series of ten minute adventures for Hello Kitty and all her friends to enjoy. From the start we’re introduced to a cute and easy-to-sing-along-to theme song in English. Now obviously some fans are going to be upset at first when they see that there is only an English audio track present on the DVD. However, the catch here is that no character actually says anything. Yes, that’s right. All of the Sanrio characters present make noises to convey their feelings while the plot is driven through voice-over narration provided by veteran voice actress Wendee Lee. So unless you really must have your narration in Japanese, the quality play-by-play voiceover by Wendee Lee works very well with the “cute” theme of the series. Our first adventure introduces us to Hello Kitty & My Melody having trouble opening walnuts. 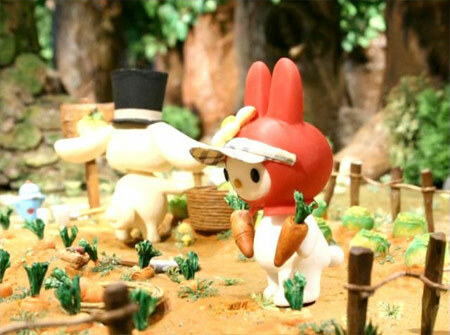 Meanwhile, Pompompurin & Cinnamoroll dig holes for a seesaw peanut-cracking device. So naturally an idea is formed to solve the problem facing Hello Kitty and My Melody. The next adventure follows the four friends working in a garden when a Cloud blows some wind, taking away the hats protecting them from the Sun. My Melody isn’t affected because she has a pair of sunglasses that she won’t share. They all lay down to take a nap, and that’s when they see their chance. One by one, each sneaky kitty or puppy plays with My Melody’s sunglasses. By the end, the sunglasses are in pieces. The third story revolves around everyone having a day of fun at Pompompurin’s house. Games & snacks entertain the group until a fight erupts when each of them wants the last biscuit. The final two episodes on the first volume tie-in together. The first part has the gang playing a game of badminton when something of Hello Kitty’s gets broken. Part two involves My Melody, Pompompurin, and Cinnamoroll trying to be friends with a heartbroken Hello Kitty. Yet, Hello Kitty continues to refuse their efforts until something magical happens to the musical beat of friendship. Hello Kitty: Stump Village was developed to follow universal stories that can easily be dubbed and shown around the world. The idea works very well in capturing something that will appeal to audiences everywhere. The series is aimed at kids, especially young girls, but is still amusing for older viewers, too. The low MSRP of $14.98 for five episodes makes this a simple choice to purchase. The claymation animation is impressive and the video is very sharp. I highly recommend fans of claymation & other animation techniques take a look at Hello Kitty: Stump Village for the hard work that was put into creating the series. 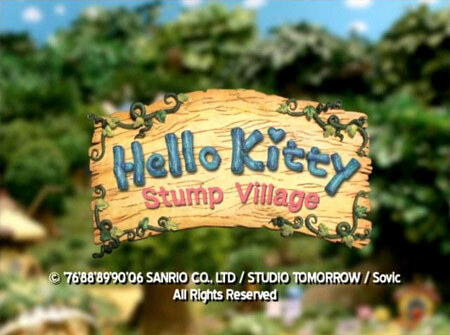 If you like Hello Kitty, cute shows, and claymation then Hello Kitty: Stump Village - A Place for Fun! is for you.